Ali Abdullahi left the St. Cloud YMCA Wednesday evening after a workout to find a disgusting sight out in the parking lot: the carcass of a deer on the hood of his car. "I was really shocked," Abdullahi said. "My jaw dropped. I stood there transfixed, not moving ... What is that? Am I dreaming?" 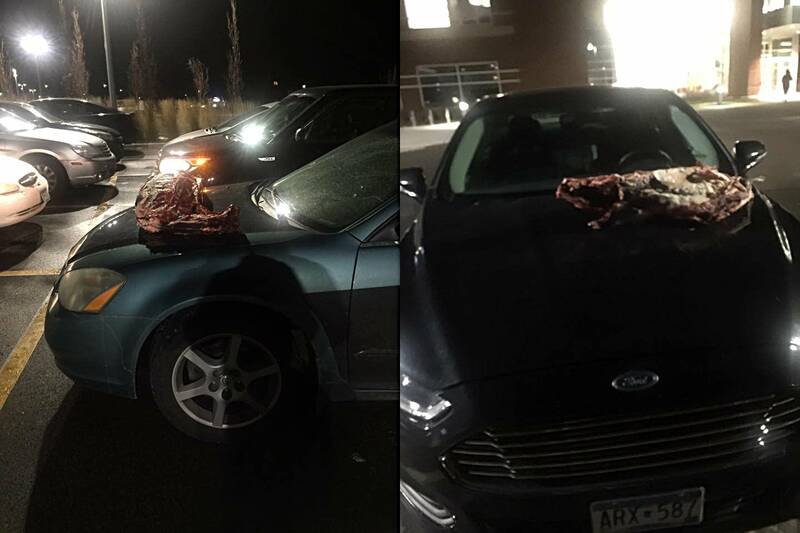 The deer carcasses were left on two vehicles in the YMCA parking lot. Both of the cars belonged to to Somali-American men, according to a St. Cloud Police Department news release Friday. After reviewing surveillance video, police identified two suspects, a 62-year-old white man from St. Cloud and his 14-year-old son, the release said. The teenager placed the carcasses while the father "sat in the vehicle knowing what was happening." Police said they considered whether the two vehicles were chosen because their owners are Somali-American, but said that nothing visible on the vehicles would have identified the race of either car's owner. The video shows the two suspects arriving in a pickup truck and backing into a space next to the two victims' vehicles, which were parked and unoccupied. One vehicle was next to the suspect's truck, and the other was behind it. Police said the man and his son first went into the YMCA for a while, then returned to their truck. The suspects told police they needed to get rid of the carcasses and dumped them. Police said they don't believe the suspects knew either of the victims. Abdullahi, 34, is a native of Somalia. He came to the United States in 2004, he said, and has lived in St. Cloud ever since. He's a naturalized citizen and works as an interpreter. He said it's the first time something like this has happened to him in St. Cloud, and it's affected him emotionally and psychologically. The night after the incident, he said he didn't go to the gym to work out like usual. "I was thinking that someone was just there to get me, especially that this was a deer hunter, and they have a rifle," he said. "And all the shootings that I have been seeing and watching ... I'm terrified. I'm just thinking that somebody is just watching me and trying to kill me." Abdullahi believes the suspects targeted him and the other victim because they are Somali-American. "I would definitely say yes, this was intentional," he said. "This was to send a message and to say, 'You're not welcome. We don't like you.'" Abdullahi said he thinks the suspects should be prosecuted, because it was more than a simple prank. "If I committed the same act, I would have been in jail," he said. "It would serve me right. I would hold myself accountable for my actions." St. Cloud police said they are forwarding the case to the city attorney for possible charges. Correction (Nov. 16, 2018): A previous version of this story reported an incorrect age for Abdullahi.